Need a bunny costume? We made a Funny Bunny for 2009 from a recycled stuffed Easter bunny. Now, I'm getting the biggest stuffed bunny I can find and improving the design. Here's the old version to help spark your creativity. 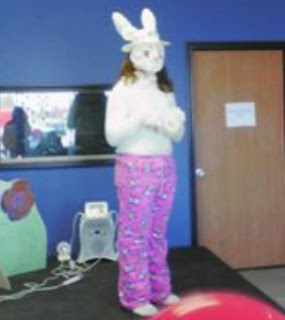 What ideas do you have for a homemade bunny costume? Here's a silly bunny joke for Easter. Enjoy! and tell some jokes to the kids. So what do you call a bunny with fleas? What is important in an easy, cute recycled costume? Simple, cheap costumes rent for $50 and sell for about $90. We made this costume from an over-sized, stuffed bunny. We took a creative trip to Goodwill, found some bunny p.j.s and a giant, floppy, stuffed bunny for $1.99. Sadly, we cut off all of her appendages, removed the stuffing, cut out eye holes, then re-attached her eyes. The ears are stuffed with a metal clothes hanger. My daughter loved wearing the stuffy's fuzzy feet and paws. I added a simple, black half-face mask for the interior structure. NO SEW - just tacky glue. The stuffy's main body/belly became a tunic to hide the wearer's neck. We'd planned to attach it to the back to cover hair, but later decided she looked like a cute girl bunny with her hair spilling out. The stuffy's tail is hot-glued to the back of the p.j.s. Get Hoppin'! Congratulations on your opening!!! That's awesome news! Looks like fun - will you be having a lot of things this summer? I'm definitely going to be looking for activities for the kids!